منطقه مورد مطالعه در مجاورت روستای شربیت و در فاصله 28 کیلومتری شمال شرق اهر )‌استان آذربایجان‌شرقی( واقع شده است. توده کوارتزمونزونیتی واقع در این منطقه میزبان تورمالین‌های گرمابی است که بر مبنای ویژگی‌های بافتی بصورت رگه‌ای، برشی، توده‌های کوارتز- تورمالینی و تورمالین‌های پرکننده فضای خالی مشاهده می‌شوند. بر اساس مطالعات سنگ‌نگاری و نتایج ریزکاو الکترونی (EPMA)، تورمالین‌ها از نوع دراویت- شورلیت (با تمایل بیشتر به سمت دراویت) بوده و در گروه قلیایی قرار می‌گیرند. ویژگی‌هایی مانند نسبت بالای Mg به Fe، منطقه‌بندی، مقدار F و تمایل به سمت بیرونی بردارهای تهی شدن از قلیایی و پروتون‌زدایی، نشانگر تشکیل تورمالین‌ها در شرایط گرمابی می‌باشند. روند عمومی عناصر نادر خاکی تورمالین‌ها با سنگ درونگیر مطابقت دارد، به‌طوریکه که در این نمونه‌ها نیز عناصر نادر خاکی سبک نسبت عناصر نادر خاکی سنگین غنی‌شدگی نشان می‌دهند. این الگو بیانگر کنترل این عناصر توسط سنگ میزبان بوده و نشان می‌دهد که سیال گرمابی غنی از بُر نقش نسبتاَ کم‌تری داشته است. The Studied area is located in vicinity of the Sherbit village, about 28 km to the northwest of Ahar (in Eastern Azerbaijan province. Quartz monzonite intrusion is the host rock of hydrothermal tourmaline in this area. On the basis of their textural features, the tourmalines can be divided into four groups: 1) tourmaline veins, 2) tourmaline-breccias, 3) massive tourmaline and 4) pore space filling tourmaline. Based on the petrography and electron microprobe analysis studies, tourmalines of Sherbit area are correspond to intermediate schorl-dravite with more tendencies toward dravite composition and have been formed in hydrothermal conditions. According to reasons such as more Mg values compared to Fe, low Al amounts, fine scale zoning, content of fluorine, tendency toward outer side of alkali- and proton-deficient vectors and lack of negative correlation between Fe and Mg. Separated tourmaline from the quartz– tourmaline vein shows a very similar pattern to the quartz monzonite samples, which are characterised by a pattern with depletion in HREEs relative to LREEs. It can be concluded that REE concentrations and patterns of tourmaline from the different studied tourmaline rocks are controlled by the host rock and not by the hydrothermal fluid causing boron metasomatism. باباخانی، ع.، لسکویه، ج. ل. و ریو، ر.، 1357- نقشه زمین­شناسی 1:25000 ورقه اهر، انتشارات سازمان زمین‎شناسی و اکتشافات معدنی کشور. توحیدی زرنق، ف.، 1370- مطالعه پترولوژی و زمین­شناسی سنگ­های آذرین منطقه شیشه (توده نفوذی دوه سراغ، شمال شرق اهر - آذربایجان شرقی)، پایان­نامه کارشناسی ارشد، دانشگاه تبریز. مهرپرتو، م. 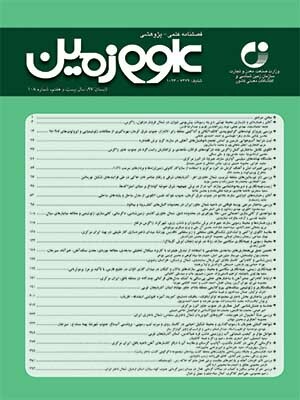 و خان‌ناظر، ن.، 1371- نقشه زمین­شناسی 1:100000 ورقه کلیبر، انتشارات سازمان زمین­شناسی و اکتشافات معدنی کشور. Boynton, W. V., 1984- Cosmochemistry of the rare earth elements: Meteorite studies, in Hendereson, p., ed., Rare earth element Geochemistry. Amsterdam, Elsevier, p.63-114. Clark, A. M., 1984- Mineralogy of the rare earth elements In P. Henderson, Ed, Rare earth element geochemistry. Elsevier, Amsterdam p. 33-61. Frondel, C. and Collette, R. L., 1957- Synthesis of tourmaline by reaction of mineral grains with NaCl-H3BO3 solution, and its implications in rock metamorphism. American Mineralogist, 42(11–2), pp.754–758. Goldschmidt, V. M., Peters, C. and Hauptmann, H., 1932- Zur Geochemie des Bors II. Nachrichten von der Gesellschaft der Wissenschaften zu Göttingen, Mathematisch-Physikalische Klasse, pp.528–545. Hawthorne, F. C. and Henry, D. J., 1999- Classification of the minerals of the tourmaline group. European journal of mineralogy, 11(2), pp.201–215. Henry, D. J. and Dutrow, B. L., 1996- Metamorphic tourmaline and its petrologic applications. Reviews in Mineralogy and Geochemistry, 33(1), pp.503–557. Henry, D. J. and Dutrow, B. L., 2001- Compositional zoning and element partitioning in nickeloan tourmaline from a ametamorphosed karstbauxite from Samos, Greece. AM. Mineral. 86, 1130-1142. Henry, D. J., Novak, M., Hawthorne, F. C., Ertl, A., Dutrow, B. L., Uher, P. and Pezzotta, F., 2011- Nomenclature of the tourmaline-supergroup minerals. American Mineralogist, 96(5–6), pp.895–913. Jiang, S. Y., Palmer, M. R., Mc Donald, A. M., Slack, J. F. and Leitch, C. H. B., 1996- Feruvite from the Sullivan Pb–Zn–Ag deposit, British Columbia. Can. Mineral. 34, 733–740. King, R. W., Kerrich, R. W. and Daddar, R., 1988- REE distributions in tourmaline: an INAA technique involving pretreatment by B volatilization. American Mineralogist, 73(3–4), pp.424–431. London, D. and Manning, D. A. C., 1995- Chemical variation and significance of tourmaline from Southwest England. Economic geology, 90(3), pp.495–519. Manning, D. A. C., 1982- Chemical and morphological variation in tourmalines from the Hub Kapong batholith of peninsular Thailand. Mineralogical Magazine, 45(337), pp.139–147. Raith, J. G., Riemer, N., Schöner, N. and Meisel, Th., 2004- Boron metasomatism and behaviour of rare earth elements during formation of tourmaline rocks in the eastern Arunta Inlier, central Australia. Contributions to Mineralogy and Petrology, 147(1), pp.91–109. Seedorff, E., Dilles, J. H., Proffett, J. M., Einaudi, M. T., Zurcher, L., Stavast, W. J. A., Johnson, D. A. and Barton, M. D., 2005- Porphyry deposits: Characteristics and origin of hypogene features. Economic Geology 100th ANNIVERSARY VOLUME, p.251-298. Sinclair, W. D. and Richardson, J. M., 1992- Quartz-tourmaline orbicules in the seagull batholith, Yukon Territory”. Can. Minera. 30 923- 935. Slack, J. F., Palmer, M. R., Stevens, B. P. J. and Barnes, R. G., 1993- Origin and significance of tourmaline- rich rocks in the Broken Hill district, Australian. Economic Geology, 88 (3), 505-541. Trumbull, R. B. and Chaussidon, M., 1999- Chemical and boron isotopic composition of magmatic and hydrothermal tourmalines from the Sinceni granite--pegmatite system in Swaziland. Chemical geology, 153(1), pp.125–137. Van Hinsberg, V. J., Henry, D. J. and Marschall, H. R., 2011- Tourmaline: an ideal indicator of its host environment. The Canadian Mineralogist, 49(1), pp.1–16. Yavuz, F., Karakaya, N., Yıldırım, D. K., Karakaya, M. C. and Kurmal, M., 2014- A Windows program for calculation and classification of tourmaline-supergroup (IMA-2011). Computers and Geosciences, 63, pp.70–87.